Our guests discuss The Trump Syllabus: Teaching Children about Trump. With: Dr. Karsonya “Kaye” Wise Whitehead, Associate Professor of Communication and African and African American Studies at Loyola University Maryland and author of Race Brave: New and Selected Works, Notes From a Colored Girl: The Civil War Pocket Diaries of Emile Frances Davis and My Black Sons: Raising Boys in a Post-Racial America; Dr. Rob Helfenbein, Associate Dean of Education at Loyola; and Dr. Stephen Hall, Program Coordinator of History at Alcorn State University. 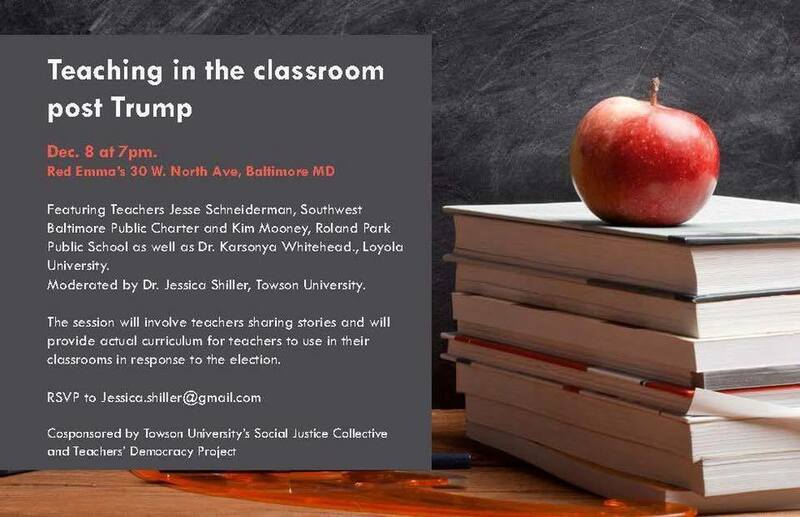 The Trump Syllabus teach-in will be at 7pm, December 8th and Red Emma’s which is located at 30 W. North Avenue.